Home Fashion and Lifestyle “FACE OF ANKARA” changed to “ANKARA FASHIONISTA 2017” by organizers. “FACE OF ANKARA” changed to “ANKARA FASHIONISTA 2017” by organizers. ORGANIZERS OF “FACE OF ANKARA” FASHION SHOW CHANGE EVENT NAME TO “ANKARA FASHIONISTA 2017”. The organizers of “FACE OF ANKARA” Fashion Show have changed the name of their proposed Fashion Show to “ANKARA FASHIONISTA 2017”. The change of the event from “FACE OF ANKARA” FASHION SHOW 2017 to “ANKARA FASHIONISTA” came following a call received by the Project Manage on 6th September 2017 from the Project Director of FACE OF ANKARA NIGERIA Mr. Ibuot Jude Joseph. 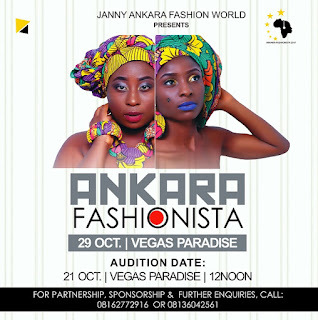 In his call, Mr. Ibuot Jude Joseph said that “FACE OF ANKARA” is a registered name under Cooperate Affairs (CAC) of the Federal Republic of Nigeria and that for the organizers of the event to go ahead with the name an official letter asking for permission to use the name “FACE OF ANKARA” should be addressed to their Cooperate Office. The Organizers having done exactly as directed by the Project Director waited too long for the feedback but couldn’t hold it any longer for than to go ahead with a new name for the fashion show as well as fixing Audition and Event date. “The change of the event was to enable us move ahead with the planning while we fix audition and event date rather than waiting to be granted permission to use “FACE OF ANKARA” as earlier proposed. We strongly believe “ANKARA FASHIONISTA” will take us somewhere as it has come to remain as one of the Leading Fashion Firm in AKwa Ibom State”. “ANKARA FASHIONISTA” is organized by Janny Ankara Fashion World and it is a Fashion Show not just designed to showcase various Fashion Designers in Akwa Ibom State and Nigeria at Large; but to also showcase upcoming Models, Media Houses, Female Presenters and screen Divas. The Event is officially scheduled to hold on 29 October at Vegas Paradise, Udo Umana Avenue Opposite Loto Office while Audition holds at the same venue on 21 October, 2017. Interested Contestants are to pick up their forms in Ikot Ekpene by calling 08162772916 and Uyo by Calling 08161168346. For Partnership and Sponsorship, please call: 08136042561.